This study aims to evaluate indications, complications and surgical technique in the endonasal endoscopic approach to orbital tumor resection. In this retrospective review, 11 patients who admitted and underwent endoscopic orbital surgery were reviewed. Demographics, preoperative and postoperative eye examination, and size and imaging characteristics of the tumours were tabulated. The endonasal approach was selected for tumors located nasal to optic nerve and in medial-inferior orbit to orbital apex. Under general anaesthesia, ethmoidotomy was performed with the aid of endonasal endoscope. The lamina papyracea was then fenestrated and through that opening, the intraorbital tumor was isolated and removed. If necessary, an auxiliary transcaruncular incision was made to facilitate the exposure. An en bloc removal of tumors was achieved in all cases. Pathological examination has confirmed that 9 patients had cavernous haemangioma, 1 patient had schwannoma and 1 had dermoid cyst. The dimension of tumors ranged from 15 × 12 × 10 mm3 to 24 × 23 × 16 mm3. Four tumours were located nasal to the muscular cone and 5 tumors were in the muscle cone, 1 tumor in the medial rectus. After operation, the best-corrected visual acuity improved in 3 patients, with a full recovery of visual field defects. Two patients had impaired visual acuity. Three patients had transient limitation of ocular movements. Abduction and adduction remain restricted in 1 case, respectively. Combination of endonasal endoscopy and orbital surgery technique can improve safety and efficacy in the transethmoidal resection of medial or inferior orbital tumours or orbital apex tumours. Endoscopic endonasal approach has been developed in the field of sinus surgery during the last 20 y with the advantage of less invasiveness and better visibility. With the advancement of imaging, nasal endoscopic anatomy and surgical instrumentation, this approach has been applied in the skull base surgery, e.g. skull base tumor excision and optic canal decompression [1-4]. But the use of endoscopic techniques to manage lesions in the orbit is still restricted. This is because orbits are solid organs with highly dense structures like eyeballs, optic nerve, etc., making it difficult to operate endoscope locally, given the fact that orbital fat and extraocular muscles obstruct view. However, in recent years, there has been increasing interest in the use of the endoscope to repair orbital wall fractures and intraorbital tumors [5-10]. The endoscopic transethmoidal approach can be a candidate if a tumor is located in the muscle cone, with its centre located in the medial-inferior quadrant of the orbit on the axial slice and nasal and inferior to the optic nerve on the coronal slice . Traditionally a medial orbital lesion can be approached via a combined medial and lateral orbitotomy, which could make obvious operation injury and spend more operation time. The visual surgical space is very narrow, so postoperative loss of vision in cases with medial tumours is more common than those with lateral ones. The skin scar of lateral canthus can’t be avoided. The endoscopic transethmoidal approach has advantages on these issues. This is because the tumor is easily accessed between medial and inferior rectus through the skeletonized lamina papyracea. A tumor will become more approachable when its medial surface is close to medial orbital wall without any fat intervening. The easiest cases are characterized by tumors resting on the lamina papyracea, sometimes with bulging of the lamina into the sinus cavity as a result of chronic compression. The aim of this study is to summarize author’s experience to carry out endoscopic transethmoidal resection of intraorbital tumors, and discuss indications and relevant surgical techniques. This study was approved from hospital ethics committee of the General Hospital of Armed Police. We retrospectively reviewed 11 patients who underwent endonasal transethmoidal resection of intraorbital tumors between May 2014 and November 2014. Eye function variables were assessed including of corrected vision, exophthalmos, ocular motility, upper eyelid movement, etc. Patients with a reduced corrected vision received fundus, pupils and vision field examination (Humphrey automated perimeter 750, Zeiss, Germany). The nature, shape and location of tumors were demonstrated by Computed Tomography (CT) or Magnetic Resonance Imaging scans (MRI), with a detailed record of maximal anteriorposterior diameter in the axial view and maximal transverse diameter and vertical diameter in the coronal view. This study was conducted in accordance with the declaration of Helsinki. This study was conducted with approval from the Ethics Committee of the General Hospital of Armed Police. Written informed consent was obtained from all participants. Based on imaging analysis (CT and MRI scan, Figure 1), the inclusion criteria includes: (1) On the axial view, anterior pole of the tumor is situated behind the posterior pole of eyeball, and may reach up to the orbital apex; (2) On the coronal view, the center of tumor is situated nasal to the optic nerve in the muscle cone. In some cases, a large tumor may present with its border extended superior to the optic nerve and to the temporal quadrant; (3) The tumor is situated nasal to the muscle cone, and the top of the tumor can reach the nasal side of superior oblique muscle and the bottom can reach below to the inferior rectus muscle; (4) No sinus inflammation or severe nasal septum deviation; (5) Preoperative imaging diagnosis suggestive of cavernous haemangioma, schwannoma or dermoid cyst. The features of cavernous haemangioma are round or oval lesion with clear margin. It shows middle signal in T1WI and T2WI MR with multifocal enhancement. The features of schwannoma are also round, oval or dumb-bell shaped lesion with clear margin. It shows middle signal in T1WI and high signal in T2WI MR with extensive enhancement. Dermoid cyst shows low density in CT scan. It’s MR features are both high signal in T1WI and T2WI with no enhancement. Figure 1: Patients’ imaging appearances. (A) Patient 1 T2-weighted MRI images in the coronal view shows a right orbital tumor located extracone inferior to the roof of ethmoid sinus; (B) Patient 2 T2- weighted MRI images in the coronal view shows a left orbital big tumor located in the muscle cone nasal to the optic nerve, spreads superiorly to the superior nasal quadrant and laterally to inferior temporal quadrant; (C) Patient 3 T2-weighted MRI image in the axial view shows a right orbital tumor located nasal to the muscle cone, deep into the anterior edge of optic canal; (D) Patient 5 T1- weighted MRI enhanced image shows a left dumb-bell shape tumor in the orbital apex, which located inferior and nasal to the muscle cone; (E) Patient 6 CT image in the axial view shows a right round tumor occupied in the orbital apex, inferior to the optic nerve. Standardized endonasal ethmoidectomy was performed using a 0 degree endoscope (HD380, De Long Cooperation, and Beijing, China). The whole process was monitored and recorded. Under the general anaesthesia, vasoconstriction was achieved with ribbon gauze soaked with 1% adrenaline packed around nasal cavity and middle meatus, which shrinks mucosa, making it thinner and thereby reducing bleeding. Next, ethmoidotomy was performed. Briefly, the lower third of the uncinate process was excised, and then ethmoidal bulla was exposed with backbiting forceps. Subsequently, the basal lamella of middle turbinate was removed, followed by a further dissection of posterior ethmoid cells. An adequate exposure results in the middle turbinate as the medial border of operation field, the roof of ethmoidal sinus as the top border, and aperture of sphenoidal sinus as the deep border. Sometimes, middle turbinate may be excised entirely to facilitate surgeon’s view. The lamina papyracea was then gently fenestrated and orbital periosteum was incised. If necessary, an adjunctive transcaruncular incision was made to prevent orbital fat herniation into the operation field and better expose the tumor. After a gentle separation along medial orbital wall to the depth of tumor location, two malleable ribbon retractors were used to retract the surrounding fat, allowing the tumor to herniate into the ethmoid cavity. Sometimes, it was necessary to retract the medial and inferior rectus muscle in order to characterise the relationship of the tumor and rectus muscle. Next, tissue forceps were used to deliver the tumor into the sinus cavity. In case of adhesions to surrounding tissues, suction or blunt dissection was used to define and dissect the tumor, taking advantage of the access from both nasal sinus and orbital entries. Careful dissection and optimal visualization may minimize possible injuries to extraocular muscles, optic nerve and other delicate orbital structures. Finally, the tumor was clamped out with tissue forceps (Figure 2). In cases of schwannoma, a curette was used instead to scrape the tumor out as a whole or in blocks, so as to avoid clamping (Figure 3). In cases of cysts, the contents were emptied first and then the remaining capsule was then carefully dissected and clamped out. No special treatment is required for a mild intraorbital bleeding, because small ooze will presumably drain out into sinus through the fenestrated lamina papyracea. For major bleeding, careful haemostasis was performed with bipolar cauterization or packed absorbable haemostatic materials into the nasal cavity. Postoperatively, the eye was placed under a pressure bandage for 1 to 3 d. Antibiotics and haemostatics were routinely administered. All the patients were reviewed at 1, 2, and 3 months to assess ocular functions and sinus healing. Imaging studies were repeated at 3 months after surgery. Figure 2: Endoscopic endonasal resection of a left orbital big cavernous haemangioma in the muscle cone nasal to optic nerve in the patient 2 (M: Medial Rectus, I: Inferior Rectus, T: Tumor. The arrow shows brain spatula). (A) A tumor that is located inferior and nasal to the optic nerve exposed through the fenestrated lamina papyracea, and brain spatulas used to block out the surrounding fats; (B) The tumor will be clamped out with a tissue forceps; (C) The tumor is moved out via the ethmoid sinus. Figure 3: Endoscopic endonasal resection of a left orbital small schwannoma inferior to the optic nerve in the patient 5 (T indicates the tumor. The arrow shows a strabismus hook is placed deep into the orbit via transcarunclar incision and points towards the ethmoid sinus cavity. The double arrow indicates optic nerve). (A) The black dotted line marks the border of the tumor, which is covered by periosteum; (B) Hoar tumor parenchyma is visualized after opening the periosteum; (C) A curette is used to scrape the tumor out; (D) The black dotted line marks the tumor bed after removal, no residues. The optic nerve is under the direct view. An en bloc removal of tumors was achieved in all the cases. Pathological examination has confirmed that 9 patients had cavernous haemangioma, 1 patient had schwannoma and one had dermoid cyst. The dimension of tumors ranged from 15 × 12 × 10 mm3 to 24 × 23 × 16 mm3. Four tumors were located nasal to the muscular cone and 5 tumors were in the muscle cone. Additionally, one tumor was in the medial rectus, one was simultaneously in the intraconal and extraconal spaces. In 8 cases, the tumors were located in the orbital apex and in the other 3 cases; The tumors were in the medial-inferior orbit. After operation, the best-corrected visual acuity improved in 3 patients, with a full recovery of visual field defects. Two patients had impaired visual acuity. Three patients had transient limitation of ocular movements, which disappeared in 1 month at follow-up (Patient ID 2, 6 and 8). Abduction and adversion remain restricted in 1 case after 3 months, respectively (Patient ID 4 and 9). All complications are recorded in the cases with intraconal tumors. Details are showed in Table 1. Note: RAPD is relative afferent pupil defect; Visual acuity is best-corrected visual acuity. Table 1: Demographics, presentations, tumour characteristics and complications. Table 1 illustrates patients’ demographics, preoperative and postoperative ophthalmic features, nature, size and location of the tumors. The follow-up period ranged from 3 to 7 months, with a median of 4.5 months. Pathological examination was done in all of the 11 cases. Postoperative imaging studies showed no tumor recurrence. Endoscopic transnasal orbital surgery is gradually considered a good alternative to external approaches for cavernous haemangioma and others tumors located in the medial and inferior quadrant of the orbit, with the advantages of minimally invasive surgery. Dubal reviewed all studies on purely endoscopic endonasal orbital tumor resections by the MEDLINE database in 2014 . In all 71 cases, the most common tumor was cavernous haemangioma (45%), followed by osteoma, schwannoma and solitary fibrous tumor. In our study, there is one case with dermoid cyst, which hasn’t been reported in present literatures. Lenzi made a literature review of endoscopic transnasal surgery of orbital cavernous haemangioma in 2014 using PubMed and Scopus and 12 papers with 17 cases were identified . His conclusions showed intraconal cavernous haemangioma located inferiorly and/or medially to the optic nerve were amenable to transnasal endoscopic resection. One of the key skills of this surgery was the management of the medial rectus muscle to obtain access to the intraconal space. With these literatures and our experiences, endoscopic endonasal approach for intraorbital tumors has the following advantages: (a) Intrinsic drawbacks are associated with anterior, lateral or combined orbitotomy, e.g. inadequate illumination when exploring the area medial to the optic nerve, limited space for surgical manipulation, especially in the orbital apex. Furthermore, to reach and separate tumors, temporal muscle, extraocular muscles, orbital fat are inextricably displaced. It may even cause compression to the optic nerve and eyeballs when brain spatula is used to provide additional space for operation. In contrast, endonasal approach is able to bypass the biggest obstacle to orbital surgeries-eyeballs and orbital margin, and get easy access to intraorbital lesions through sinus cavity. The illumination and magnification functions of endoscopes greatly improve the visualization, making the exposure process of a tumor easier and at the same time, only a minor damage to ethmoid cell and lamina papyracea being expected; (b) A tumor in the medial orbit that is approached via the transethmoidal approach can be delivered into ethmoidal sinus with tissue forceps. By doing this, adequate surgical space is obtained between the lateral aspect of a tumor and the optic nerve, thereby allowing for an ideal separation of the tumor from surrounding tissues and protection of visual function, especially when optic nerve in the apex is heavily adhered; (c) Benefit from the use of a monitoring that is able to amplify and achieve direct observation of de-adhesion process, especially that at the posterior pole of a tumor, the application of endoscopic transethmoidal approach prevents optic injury from accidental injury caused by using aspirator or probe. This has figured out the challenge of an inability to separate the posterior pole of a tumor under direct vision when taking traditional external approach, as the tumor itself can block the view; (d) The transethmoidal surgical approach can be regarded as drainage for intraorbital bleeding into sinuses through the fenestrated lamina papyracea, although the risk of enophthalmos may exist. Although endoscopic transethmoidal orbital surgery has been adopted as an effective alternative to external approaches, some limitations must be noted. Firstly, in terms of the location of a tumor, it is not appropriate for tumors in the anterior orbit, which should be accessed through an anterior orbitotomy. The medial endoscopic approach is certainly contraindicated if the mass extends superolaterally to the optic nerve. Our experience shows that endoscopic transethmoidal approach is a reliable option for a mass situated nasal to the optic nerve with a diameter>2 cm, no matter whether it extends superior to the optic nerve or in the inferior temporal quadrant. However, it is less feasible if the main body of a mass is in the superior nasal quadrant to the optic nerve and its diameter is <1.5 cm, because the dissection in the quadrant between the inferior and medial rectus and then between medial rectus and optic nerve may cause a crush injury to the optic nerve laterally. Lenzi’s review showed mean maximum diameter of cavernous haemangioma resected by endoscopic transnasal skill was only 16.0 ± 6.8 mm . Our results are obvious out of this range. So, the location of lesion is more important factor than the diameter. Secondly, the nature of a tumor should be considered, either. Given the fact that there is a limited space in the orbit to place instruments, making it difficult to perform complicated actions such as haemostasis, suturing, etc. Endoscopic transethmoidal approach is applicable is suitable for the removal of cavernous haemangioma, schwannoma and dermoid cyst. Cavernous haemangioma is readily clamped out with tissue forceps without the concern that the capsule would be broken. Chhabra et al. found the ophthalmologic Cryoprobe® (MIRA Inc., Waltham, MA) to be useful to freeze and excise these tumors . The rapid freezing and thawing of the Cryoprobe tip allows for instant grasping and release of the tumor. In case of schwannoma, after opening the capsule, a curette was used to scrape the tumor out as a whole or in blocks. Usually with typical imaging findings, dermoid cyst tends to occur at the lateral orbit, especially near the frontozygomatic suture. It is crucial to remove the remaining coat thoroughly. We have only one patient diagnosed of dermoid cyst in this study, which originated from medial rectus. A careful dissection was required to separate it from the muscle fibres. Another common feature of these tumors is generally not secondary to severe bleeding. Other solid tumors such as lymphoma, meningioma, and osseous tumors may be biopsied or resected with this approach, either [8,14,15]. The orbit is not a hollow organ, which is occupied by intense structures. Based on our experiences, the following tips help to operate in the orbit with endoscope: (a) For tumors in the muscular cone, 1 to 2 brain spatulas were placed via nasal cavity or transcaruncular incision and used to block out the surrounding fats and extraocular muscles, making the tumor readily to herniate out through the fenestrated lamina papyracea; (b) Sometimes, it is difficult to identify small tumors in the orbital apex, which may be closely attached to extraocular muscles. To avoid possible injury to muscles, a technique of rectus muscle retraction was developed whereby the medial and inferior rectus muscles are isolated . Furthermore, by doing this, a mass is readily differentiated from muscles and herniated out due to an alteration of muscular tone. Alternatively, Wu et al. proposed to detach and relax the medial rectus so as to get access to the superior nasal quadrant of the optic nerve ; (c) During the process of posterior pole de-adhesion of a tumor, it is more flexible to approach a probe transcaruncularly rather than transnasally, and therefore improve the angle of access; (d) If imaging tests show a large space occupying lesion in the orbital apex with a displacement of optic nerve and no identified fat, which is indicative of a serious adhesion, a separation process should initiate from nasal cavity or transcaruncular incision . If still difficult, a transconjunctival or lateral orbitotomy should be undertaken to make more room between lateral aspect of a tumor and optic nerve [17,18]; (e) Cavernous haemangioma is distressing for its fragility and bleeding tendency when being clamped. Bleeding can make the operation field less clear. The tumor also becomes smaller in volume and is easily sheltered by fat tissues. Therefore, adequate exposure is necessary before it being clamped out gently. If necessary, brain spatulas are used to block out surrounding fats. In summary, depending on the endoscopic experience and familiarity with the orbital anatomy, one can develop his own surgical skills. It has been frequently reported that the application of endoscope in the treatment of nasal sinus diseases is associated with serious orbital complications, e.g. the injuries of optic nerve or medial rectus [19,20]. This occurs because lamina papyracea may be mistakenly treated as ethmoid cells, consequently entry into the orbit. An easy approach to identify the lamina papyracea and the lesion is to place a strabismus hook deep into the orbit via the transcaruncular incision and point it towards the ethmoid sinus cavity. This procedure helps to determine the site to fenestrate the lamina papyracea. Intraoperative navigation maybe is the best solution for locating the tumor, but the expensive equipment limits it’s using . There were no serious complications in the cases reported in this study. Two patients had impaired visual acuity that was probably due to optic nerve injury in the orbital apex related to dissection of adhesions between the tumor and optic nerve. Five patients had limited ocular movements, 3 of which resulted from operation-induced oculomotor nerve palsy or extraocular muscle injury and resolved in one month. Mild reduced abduction was recorded in one patient, and has not resolved. Based on imaging results, the reason may be a displacement of medial rectus into the ethmoid sinus, with muscle function restricted by surrounding scar tissue. Another patient with dermoid cyst had mild adduction limitation, possibly caused by the injury to the medial rectus or its dominant nerve following cyst excision. In our study the complications are more frequently associated with a tumor inside the muscle cone than extraconal tumors, which are confirmed by Bleier et al. Dubal’ s review supported this opinion too, the complication rate of which was higher for intraconal tumors (48.0%) than for extraconal tumors (26.7%), but without statistical significance [12,22]. The major determinants of the incidence of complications are the extent to which the tumor adheres to the optic nerve, oculomotor nerve or extraocular muscles, the relationship between the tumor and its feeding artery, and bleeding tendency after tumor excision. Future innovations in orbital surgery should focus on techniques to optimize the dissection of the tumor from the delicate nerves, vessels and muscles of the orbit, and to further reduce complications. A multidisciplinary team, including orbital and rhinologic surgeons, is an essential component for the surgical planning and management . There are no competing interests to report for this submission. Greenfield JP, Anand VK, Kacker A, Seibert MJ, Singh A, Brown SM, Schwartz TH. Endoscopic endonasal transethmoidal transcribriform transfovea ethmoidalis approach to the anterior cranial fossa and skull base. Neurosurg 2010; 66: 883-892. Blake DM, Husain Q, Kanumuri VV, Svider PF, Eloy JA, Liu JK. Endoscopic endonasal resection of sinonasal and anterior skull base schwannomas. J Clin Neurosci 2014; 21: 1419-1423. Chen F, Zuo K, Feng S, Guo J, Fan Y, Shi J, Li H. A modified surgical procedure for endoscopic optic nerve decompression for the treatment of traumatic optic neuropathy. N Am J Med Sci 2014; 6: 270-273. Jacquesson T, Abouaf L, Berhouma M, Jouanneau E. How I do it: the endoscopic endonasal optic nerve and orbital apex decompression. Acta Neurochir (Wien) 2014; 156: 1891-1896. Wu W, Jing W, Selva D, Cannon PS, Tu Y, Chen B. Endoscopic transcaruncular repair of large medial orbital wall fractures near the orbital apex. Ophthalmol 2013; 120: 404-409. Muscatello L, Seccia V, Caniglia M, Sellari-Franceschini S, Lenzi R. Transnasal endoscopic surgery for selected orbital cavernous hemangiomas: our preliminary experience. Head Neck 2013; 35: 218-220. Chhabra N, Wu AW, Fay A, Metson R. Endoscopic resection of orbital hemangiomas. Int Forum Allergy Rhinol 2014; 4: 251-255. Lee JY, Ramakrishnan VR, Chiu AG, Palmer J, Gausas RE. Endoscopic endonasal surgical resection of tumors of the medial orbital apex and wall. Clin Neurol Neurosurg 2012; 114: 93-98. McKinney KA, Snyderman CH, Carrau RL, Germanwala AV, Prevedello DM, Stefko ST, Gardner P, Kassam AB, Wheless SA, Zanation AM. Seeing the light: endoscopic endonasal intraconal orbital tumor surgery. Otolaryngol Head Neck Surg 2010; 143: 699-701. Wu W, Selva D, Jiang F, Jing W, Tu Y, Chen B, Shi J, Sun MT, Qu J. Endoscopic transethmoidal approach with or without medial rectus detachment for orbital apical cavernous haemangioma. Am J Ophthalmol 2013; 156: 593-599. Castelnuovo P, Turri-Zanoni M, Battaglia P, Locatelli D, Dallan I. Endoscopic endonasal management of orbital pathologies. Neurosurg Clin N Am 2015; 26: 463-472. Dubal PM, Svider PF, Denis D, Folbe AJ, Eloy JA. Short-term outcomes of purely endoscopic endonasal resection of orbital tumors: a systematic review. Int Forum Allergy Rhinol 2014; 4: 1008-1015. Lenzi R, Bleier BS, Felisati G, Muscatello L. Purely endoscopic trans-nasal management of orbital intraconal cavernous haemangioma: a systematic review of the literature. Eur Arch Otorhinolaryngol 2016; 273: 2319-2322. Shin M, Kondo K, Hanakita S, Suzukawa K, Kin T, Shojima M, Nakagawa D, Saito N. Endoscopic transnasal approach for resection of locally aggressive tumors in the orbit. J Neurosurg 2015; 123: 748-759. Muderris T, Bercin S, Sevil E, Kiris M. Endoscopic removal of a giant ethmoid osteoma with orbital extension. Acta Inform Med 2012; 20: 266-268. Campbell PG, Yadla S, Rosen M, Bilyk JR, Murchison AP, Evans JJ. Endoscopic transnasal cryo-assisted removal of an orbital cavernous haemangioma: a technical note. Minim Invasive Neurosurg 2011; 54: 41-43. Signorelli F, Anile C, Rigante M, Paludetti G, Pompucci A, Mangiola A. Endoscopic treatment of orbital tumors. World J Clin Cases 2015; 3: 270-274. 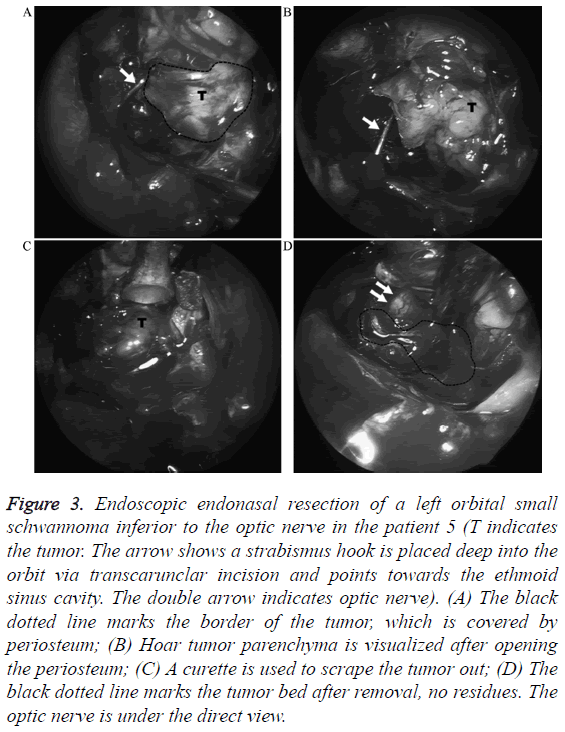 Arai Y, Kawahara N, Yokoyama T, Oridate N. Endoscopic transnasal approach for orbital tumors: A report of four cases. Auris Nasus Larynx 2016; 43: 353-358. Ramakrishnan VR, Kingdom TT, Nayak JV, Hwang PH, Orlandi RR. Nationwide incidence of major complications in endoscopic sinus surgery. Int Forum Allergy Rhinol 2012; 2: 34-39. Suzuki S, Yasunaga H, Matsui H, Fushimi K, Kondo K, Yamasoba T. Complication rates after functional endoscopic sinus surgery: analysis of 50,734 Japanese patients. Laryngoscope 2015; 125: 1785-1791. Gazioglu N, Abuzayed B, Tanriover N. Neuro navigation guided endoscopic endonasal excision of an intraorbital intraconal cavernous haemangioma. J Craniofac Surg 2011; 22: 1802-1805. Bleier BS, Castelnuovo P, Battaglia P, Turri-Zanoni M, Dallan I, Metson R, Sedaghat AR, Stefko ST, Gardner PA, Snyderman CH, Nogueira JF, Ramakrishnan VR, Muscatello L, Lenzi R, Freitag S. Endoscopic endonasal orbital cavernous haemangioma resection: global experience in techniques and outcomes. Int Forum Allergy Rhinol 2016; 6: 156-161. Yao WC, Bleier BS. Endoscopic management of orbital tumors. Curr Opin Otolaryngol Head Neck Surg 2016; 24: 57-62.